You've made an awesome app. You put in the time, gave it some unique features, added your own flair to the design, and released it to the Play Store! You know if people start to pick up on it, they will love it and use it all the time, but how do you acquire those users? Unfortunately, not everyone is fortunate enough to get the coverage that Klinker Apps has gotten over the years. We got into the market at a great time and we were extremely lucky to have our work picked up! Making an app is hard, and finding your users can be even harder. While developing our apps, both Jake and I have been exposed to, and had to use, different marketing techniques to get the word out. Some of them have been more successful than others, and we are constantly trying to learn and improve our marketing. It is a huge part of any business. As with anything, start small. You probably won't hit a home run your first time up to the plate. If you are just starting out, find a few people you trust to get some initial feedback. Whether that is friends, family, or other people on the internet, you need to hear how people would use the app and what types of things they are looking for. It may not be what you expect! I find that the best place to start is just to post on social media. It's free, and there are plenty of people willing to take a look and give you their thoughts. 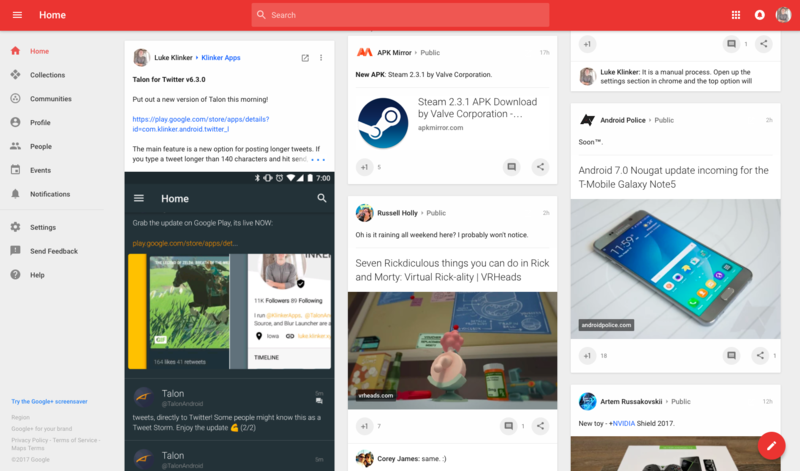 Try out a developer communities on Google+, post something on Reddit, or seek out someone on Twitter. I know I am always open to providing feedback on ideas, design, implementation, best practices, or anything you are curious about. I think you would be surprised how many people carry that same attitude. Any exposure and feedback you can get is great! Ask for their thoughts and if there is anything more they would be looking for, out of an initial release. After you hear from these testers, and before trying to hit the acquisition harder, use that feedback to improve the app! Note: You can't, and probably shouldn't, implement every single request or tweak that gets suggested. They may not align with your vision. That doesn't mean that you shouldn't keep these requests in mind for later though. Your users want your app to be perfect, and they want to help you get it there. For most of our time in Android, Klinker Apps has exclusively used social media to provide updates and announcements. It is a great way to get involved and interact with the community of users that you are trying to reach. We post on our Google+ communities and Twitter accounts fairly regularly, whenever we want to provide an update. For us, especially after getting a solid base of past users, this remains our main growth channel for any new apps. Don't discount the use of social media with your app, it is an amazing - and free - way to get the word out and find your start! Advertising is a new practice for me. After consulting for a few companies that used advertising to great effect, I wanted to try it out on my own work. While social media is a great place to start with your app, you are never going to hit your entire potential user base. Not everyone is active on social media and not everyone is in the developer communities that you used for the initial feedback. I stayed away from advertising for too long. I always thought that I was hitting most of my users from blog coverage and social media, and those were both free. I was so wrong. Since starting some small advertising with Pulse, I have almost doubled my daily downloads, and more than doubled the daily revenue. You can see part of this, in the graph above. That is the monthly acquisition graph, provided by Google Play. I will go into more detail about how advertising has given my work a boost, below! I have almost doubled my daily downloads, and more than doubled the daily revenue, in Pulse. My advertising experience comes on Google's Adwords and a little bit of Facebook ads. 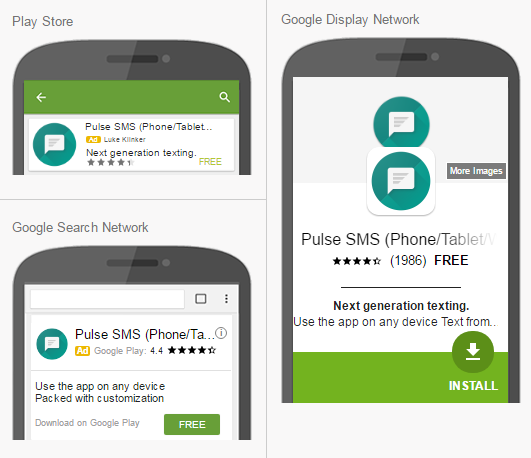 Through Adwords, Google allows you to set up a Universal App Campaign. This is basically their generic "advertise everywhere" option. It will run ads through the Play Store, YouTube, Google searches, banners within apps, and full screen advertisements. The Universal App Campaign is what I have used for my ads. Most ad networks are going to charge you on a "cost per click" basis. So whenever someone clicks your ad (not necessarily installs or purchases your app), they will charge you a few cents. Ad networks allow you to set a budget, as well as a target "cost per acquisition" or CPA. The budget is pretty self explanatory, but when I started, the "cost per acquisition" was a bit confusing. The CPA is basically how much each install is worth for your app. I have found that the higher you have your cost per conversion, the high probability that those users are going to be willing to complete your in-app purchases. In Pulse, I have a number of different in-app purchases. You can buy a 1 month, 3 month, yearly, or lifetime subscription. I have tried a number of different "cost per acquisition" rates for this app. Obviously, the goal of my advertising isn't just to bring in more downloads, but to bring in more downloads that are likely to purchase one of the subscriptions. Right now, I have my CPA in Pulse set for $0.45. I have experimented with $0.15, $0.20, and $0.30 in the past, but found that 45 cents has been the best of that lot. This means that every user that installs the app from advertising costs me about that much. If those users then spend money on one of my in-app purchases, that makes for a very nice install-to-revenue ratio. Different apps will need different CPA rates! There is no perfect rate. You will have to decide what those installs are worth for your app, and use that to determine your CPA. It isn't going to be a set number either. I highly recommend playing around with this number, to see what is optimal for you. If you go to high, it will reduce the revenue that you are bringing in, but if you go to low, then those users are not as likely to keep your app installed, or make purchases at all. Location: where do you want your ads to run? I run most of mine in the US because ~70% of my users are from the United States. That is definitely not the case for most apps though. I have found that this is more of the target market, for high-end SMS apps. Images: there isn't much point in advertising if your graphics are bad. Work on increasing the quality of your graphics and screenshots, to see if that will increase the conversion rate for installs, for the users that click your ads. Click Through Ratio: how many people are interacting with your ads, compared to the number of times your ad is shown. Average Position: Google provides different types of ads, based on where they are on the screen or webpage. This is not necessarily a ranking. Pulse started out in position #1 and has moved to position #2 over time. For a breakdown of your position and how it affects your advertising, this is a great article! Impressions: how often your ad gets shown. Even if the users don't interact with the ad immediately, they may notice it and try it in the future! 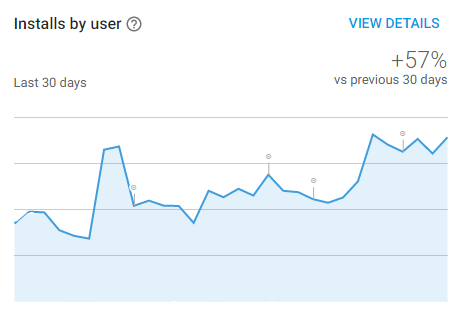 As Adwords displays my ads more and more often, I see a direct increase in the number of downloads, even when the initial ad isn't what made the conversion. The purple mark was the initial public release. We had done beta testing before that, but this was when it was released out of beta. The red mark is when I started advertising. Pulse had lost some of its initial steam from the release, so I wanted to try to pick it back up again. You can definitely see an immediate bump here! The green mark was when I bumped the CPC up to $0.45. This is when things really started to pick up. Adwords seems to be continuing to learn and provide the ad to users who are more likely to install it. Great! I am seeing more installs and a much progressively higher impression to acquisition rate. Within the past month, I have seen around a 50% increase in the number of installs, which has blown me away. I have my advertising set to run for about $16 / day, so without spending all that much through the month, I have dramatically increased the amount of traffic coming into the app and purchasing the add-ons. Remember that even if someone doesn't immediately get the app after seeing your ad, those impressions can have a lasting impact on future consumer decisions. 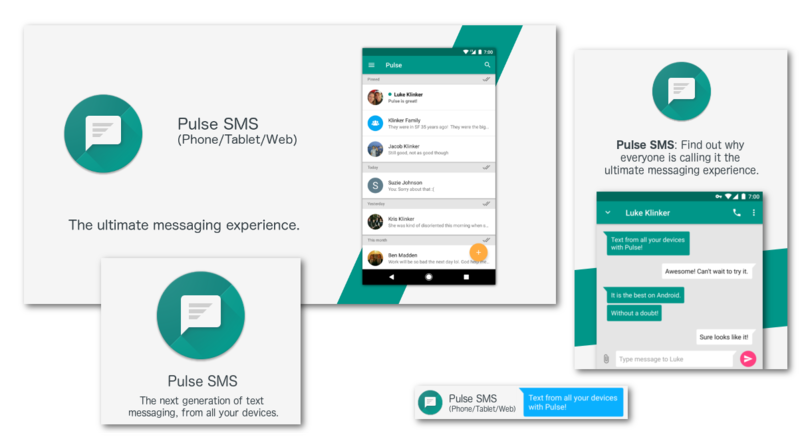 I have seen an incredible increase in the number of users that have been installing and keeping Pulse over the past few months. The growth has been phenomenal, some of it has been organic, but the advertising growth has been worth the money that is going into it. Google's Adwords continues to surprise me, and learn what is best for my app. That said, advertising will continue to be an evolving process for me. The promo images and phrases that I am currently using are the same as the ones that I started with, so that is something that I will also continue to iterate on over time. Hopefully in the future, I can make a follow-up post to compare where I am now, with the changes I have made. I would love to hear from others about how you have used advertising or other methods to reach your users. Sound off in the comments if you are willing to share!